The Rising Leaders Group is tailored to CREW Boston members who are 35 years of age or under. This group exists to provide a fun and friendly forum to connect younger professionals through a variety of social, networking, and educational opportunities geared towards the interests of Rising Leaders. Along with providing a space for members to connect with like-minded women in real estate, we also frequently invite more experienced CREW Boston members to share their experiences. We provide an excellent way for new members to get involved in CREW Boston and meet other members in an informal and welcoming setting. If you are interested in learning more about our group, please contact the Rising Leaders co-chairs at risingleaders.CREW@gmail.com. What does it take to start your own company? A group of CREW Boston’s Rising Leaders found out when we convened at Blue Moon Capital Partners’ office to hear from Kathy Sweeney and Susan Barlow, Blue Moon’s Co-Founders. Attendees learned about Kathy’s and Susan’s career paths, including an early stint on a cattle ranch, and what led them to form Blue Moon in 2013. The discussion hit on important topics like knowing when to take risks and how to persevere through tough times. Given Blue Moon’s focus on senior housing, we discussed the opportunities in that space and what inspired Kathy and Susan to start a fund focused solely on that asset type. The Rising Leaders Group kicked of the 2017-18 CREW year with a great discussion with this year’s CREW Boston President, Lisa Serafin. Lisa shared key points of her career, including graduating into a recession and the path that led to founding Redgate. The discussion spanned topics from knowing when to take risks to the difference between role models, mentors, and sponsors (and why they are all important in different ways). We also talked about Lisa’s vision for CREW and shared ideas on events and programs that are particularly appealing to the Rising Leaders group. CREW Boston presented the Anatomy of the Deal & Tour of The Pierce Boston, a landmark project by Samuels and Associates currently under construction. As the latest addition to the explosive growth in Fenway, The Pierce is one of the more complex projects Samuels has under taken, both due to the significant height and the financing structure they pursued. In January, the Rising Leaders group was appreciative to be hosted by Kim Sherman Stamler and Related Beal for the first Executive Reception of 2017. Over 25 young women from various positions in the industry, including construction, development, finance and asset management joined for the evening. As president of Related Beal, Kim lead conversation about the company’s history and recent Boston merger, as well as her career path, beginning as an intern and growing with the company. She captivated the group with discussions about employee culture and women in real estate. 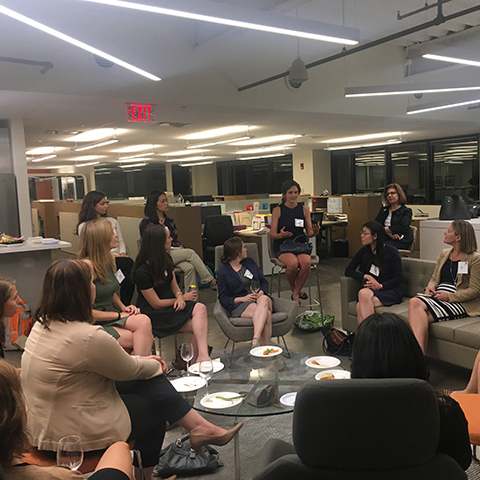 The Rising Leaders Group was thrilled to have CREW Boston Presdient Cara Nelson and special guest Haley Ayraud from Next Level Consulting at their October Reception. Cara spoke about her career while Hayley discussed her insight into networking and meaningful connections.